Our members are paid hourly, between the minimum wage and $11 per hour. It is amazing to me that the $26,000 a year paid from us to the state and national unions gets us little outside of wage freezes. I ask the state and national union representatives: Have your wages been frozen? Bob is being used by a front group that could not care less about his pay. The Mackinac Center literally wrote the 80/20 bill that forces every school employee to pay either 20% or everything above a hard cap for health insurance. The proof of this is found in a 2011 email exchange between a group of Mackinac Center employees and Rep. Tom McMillin, the Chairman of the Michigan House of Representatives Education Committee. 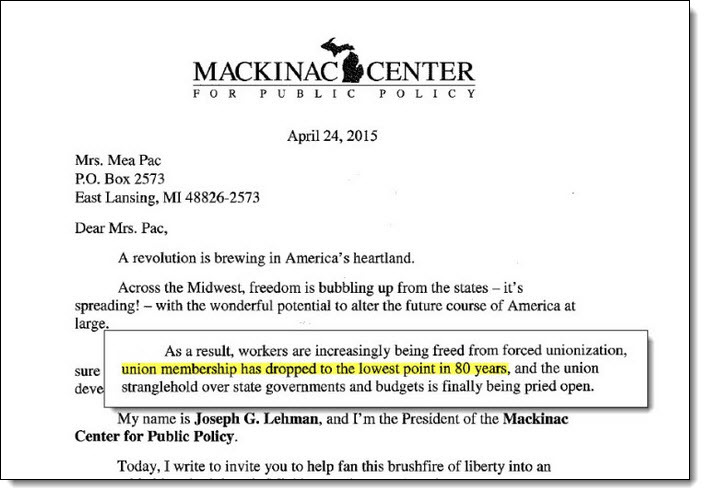 The email exchange, which can be read in its entirety here, also shows that the Mackinac Center’s immediate goal is to outlaw government collective bargaining, and it’s ultimate goal is to put the MEA out of business. Helping students or saving money is not mentioned. Next Mackinac Center Target: Your Salary Schedule. This is about killing off unions so schools can be sold off to corporations; it’s got nothing to do with helping you or the kids at your school. When the Center puts out it’s fundraising appeals, top billing goes to weakening unions. It’s their proudest achievement. In order to get on with the business of privatizing schools, the Mackinac Center is more than willing to use school employees. Particularly those who haven’t paid attention enough to recognize their actual enemies.